Weather phenomena are difficult understand unless there is firsthand. experience and in this case the East Coast Low finally explained how it happens that people say "We get Sydney Weather" along the east coast. This particular weather system is a type of cyclonic low pressure circulating down the coast causing Sydney and the East Gippsland to be at the top and bottom respectively of a swirling mass of rain laden clouds that bring huge amounts of rain water to South East Australia. Interestingly the highest rainfall recorded for this time period was Tamboon Crossing (between Ensay and Swifts Creek on the Omeo highway). 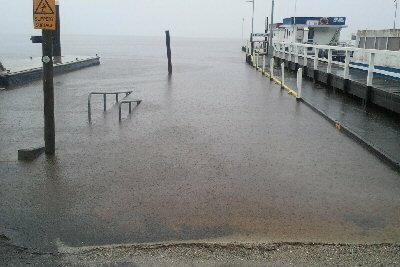 This was experienced at Mallacoota (7-9March 2012) and, as it turned out we saw a lot of the action from that location. 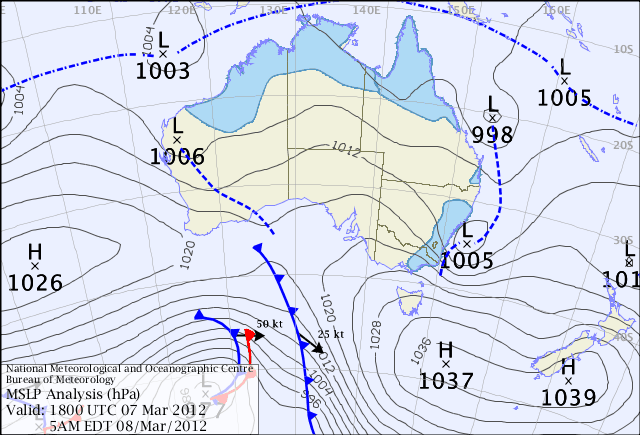 The notion of an East Coast Low can be hard to understand for people who live west of Traralgon. The weather system circulates around the lower east coast like a cyclone and brings rain to the far east Gippsland off the sea like a tropical weather system. We have captured a BOM image, taken as we waited for it to subside. It shows the pressure levels near the peak of the rain activity. The high pressure in the lower right hand side that was interpreted as a sign of good weather for the weekend has been quickly displaced to the south of the Tasman Sea and low has formed somewhere near Sydney. This has formed a kind of cyclonic depression along the East Coast and a clockwise circling weather pattern (Southern Hemisphere) bringing heavily laden rain clouds over far east Gippsland and southern/coastal New South Wales. What did this mean for Mallacoota? 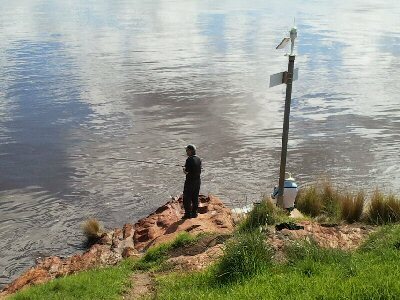 Well they ended up with about 8inches (200mm) of rain in about 8 days. The lake rose, and rose and rose, here are some photographs taken at the time that capture a little of the events around the lake system. This picture sums up the stoicism of some fishermen with their intrepid enthusiasm for trying things out, and never giving up a golden chance to catch fish. Unfortunately we did not wait around to ask if he succeeded, but we all agreed he definitely was a not a woosey fisherman!! 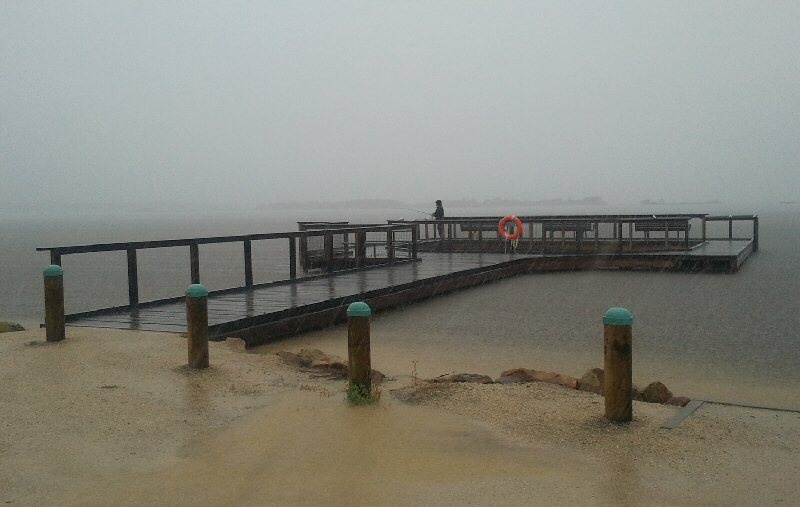 Above is the Karbethong Boat ramp and the main boat launching ramp. Both disappearing under water. No problems here with finding enough water to launch the boat! However the next day things were clearing a little and people were observed appearing out the tents and caravans in the camping ground and regular activities beginning again. Even though the water was really muddy-coloured this bloke was going to give it a go with a float in fast flowing water near the end of the caravan park. Again we did not have time to stay and ask him how he went, but he was probably just enjoying the sun and a bit of fresh air (ie no cabin fever!! ).